Nice View: French doors offer an extensive choice of window styles that will give any room of your home a gorgeous view outside, opening up your home and making your space seem much larger. When you use French doors as interior doors, the window panels give the illusion of more space, a benefit for smaller rooms and homes. They also provide natural light to each room even when they are closed. Easy Access: French door design offers a large entry point, making them useful for moving large furniture and other items that may not fit through regular entry doors. French doors are also fantastic for entertaining, giving guests open, easy access inside and outside of your home. 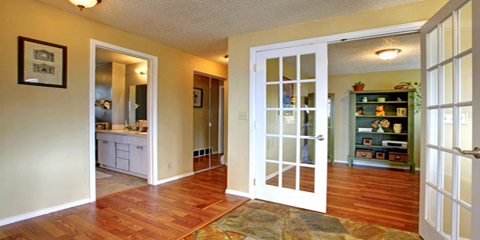 Better Value: Because French doors offer so much as far as function and aesthetic, they also add value to your home. Their versatility makes them appealing since they can be used as both interior and exterior doors, and many buyers will find French doors to be a valuable addition to the property. For more than 30 years, Murphy Home Improvement has been Cincinnati’s remodeling company of choice. Specializing in entry doors and window installation, their top quality products and extensive inventory of options make finding the perfect pieces for your next home improvement project easy. Visit their showroom with your window and door measurements and receive 10% off your purchase. Call them at (513) 922-8989 or visit them online for more information.